The Doc McStuffins Vets N Pets Care Center is a one stop vet shop for your budding veterinarians, or even just those who dote on a family pet! Featuring a large number of various scanners and instruments used by a real vet, the Doc McStuffins Care Center is a fantastic way for children to learn about compassion, about treating injury and about helping those who are hurt. It inspires children to take care of their pets, and to show compassion for their well-being. And on to of all that, it’s just great fun to pretend to be a vet! Is the Doc McStuffins Vets N Pets Care Center Worth Buying? 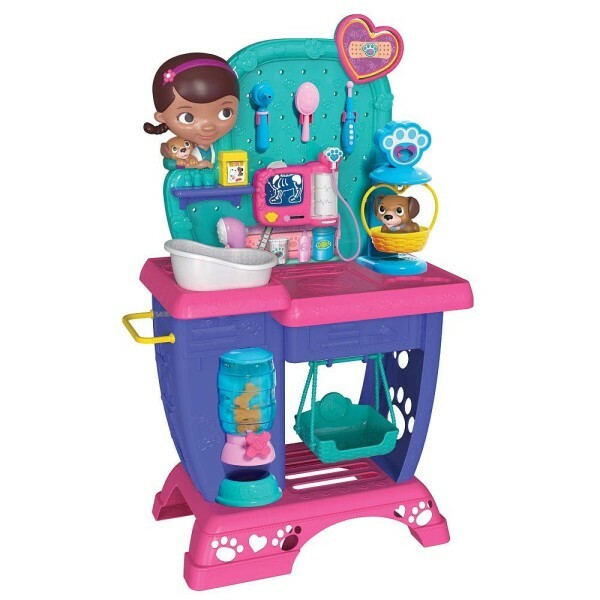 The Doc McStuffins Vets n Pets Care Center is easy on the eye, and there is no doubt that children with creative minds can easily spend hours playing with it. However, it is fair to say that not all children will instantly love this toy. Some children don’t like animals, and some children won’t engage with the toy props included, because they don’t mean anything to them. Of the instruments included, only the thermometer will make sense to many children. For this reason, it’s important to consider whether your child has expressed any interest in the concept before investing in the toy. In terms of the toy itself, it is very well made. The assembly is not overly difficult, but it does require 2 AA batteries which are annoyingly not included. The x-ray system is particularly good – when your budding vet slides an x-ray sheet into the x-ray machine, the center starts to light up and make noise. This kind of interactivity is always engaging for children, and really helps to stimulate imaginative and creative play. It is fair to say that the Doc McStuffins Vets n Pets Care Center has been designed with girls in mind, and that is an oversight. The center is coloured with pinks, purples and greens, and is clearly more welcoming to girls than boys. This is an odd choice, as there is no traditional gender stereotype when it comes to vets, but one that could impact how much a boy will instantly engage with the care center. Overall, this is a good toy, with bags of potential. The only consideration needed is whether your child is remotely interested in animals. If they are, then the Vets n Pets Care Center could be a winner.